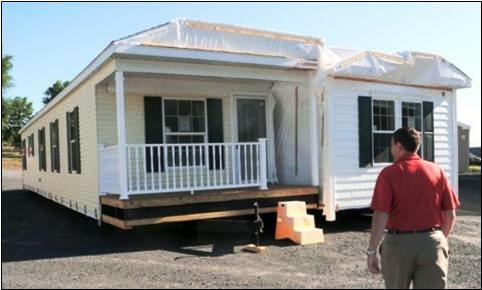 Constructed by Pine Grove Manufactured Homes Inc., the 1,904-square-foot house will be used as a display model by a builder in Glenwood Village, N.Y., a retirement community is the company’s 20,000th home. The home features an 8-foot ceiling, three bedrooms, a kitchen equipped with stainless steel appliances, brushed nickel light fixtures, Formica counter tops and a living room with columns. There are also two bathrooms, one of which has a large bathtub for soaking and a 54-inch shower stall, along with other amenities. On average, models the company builds cost $65,000 to $150,000, said Wayne Fanelli, president and chief executive officer. He is also president of Pleasant Valley Homes, a sister company with $15 million in sales, which was established in 2004. The company makes modular homes and also builds other structures, including a hotel in the north central part of the NY. "I think a lot of the success is based on the fact that we've had the same ownership, the same management for nearly 30 years," Fanelli said. The company is owned by family members and others, he said. Fanelli, who is one of the owners, has held the title of president and chief executive officer for Pine Grove Manufactured Homes Inc. since 1997. Wow and that hitch coming out the front from the mobile home chassis is really classic!!!! But don't worry it is a removable hitch and the homeowners will never see it. The name says it all. Pine Grove MANUFACTURED homes. It doesn't say that they are modular homes. Is that 20,000 houses or in mobile home jargon - floors? Also, has Pine Grove Homes been in business for 30 years? Quite a feat to survive this long. It would make them one of the few companies with that type history especially if it was under the same ownership.